For the third time in his career, and the first time in 2016, Oklahoma's Baker Mayfield has been named Davey O'Brien Quarterback of the Week. Mayfield was given the distinction Tuesday after turning in his best career game in a 66-59 win Saturday at Texas Tech, his former school. The redshirt junior connected for a school-record seven touchdowns and did not throw an interception. He was 27-of-36 through the air for a career-high 545 yards, nine shy of the OU single-game record. His 564 yards of total offense were eight short of his own program standard. The Austin, Texas, product averaged 20.2 yards per completion and 15.1 yards per attempt in the contest, and his 266.3 passing efficiency rating was the best in school history among players with at least 30 throws. 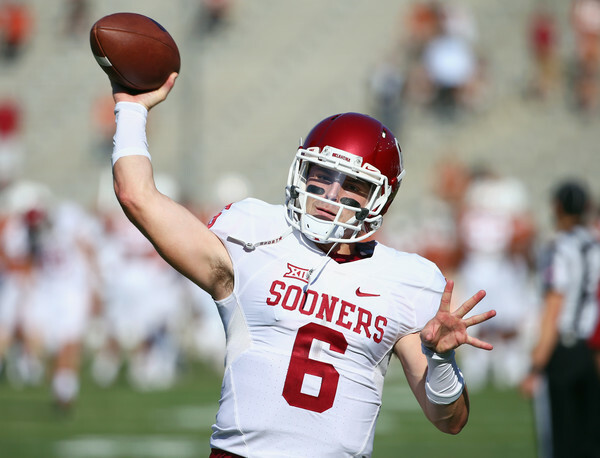 Mayfield, who finished fourth last year in Heisman Trophy voting, has thrust himself into conversation for the 2016 award. He leads the country in yards per pass attempt (11.02), and ranks third in passing efficiency rating (194.9; the NCAA single-season record is 191.8), completion percentage (.714) and yards per completion (15.45). In addition, he is sixth nationally in both passing touchdowns (23) and points responsible for (158), and ninth in passing yards (2,348) and total offense per game (353.0). One of three finalists for last year's Davey O'Brien National Quarterback Award, Mayfield earned the weekly honor twice in 2015 (Sept. 22 and Nov. 17). WATCH >> Baker Mayfield "Unexpected Warrior"
All FBS quarterbacks are eligible for the weekly award, which is determined by a subset of the Davey O'Brien National Selection Committee. The other "Great 8" quarterbacks in week eight were: Jerod Evans of Virginia Tech, Washington State's Luke Falk, Ben Hicks of SMU, Louisville's Lamar Jackson, Patrick Mahomes II of Texas Tech, Middle Tennessee's Brent Stockstill and Will Worth of Navy. The Davey O'Brien Foundation is celebrating its 40th anniversary in 2016 and has granted nearly $1 million in scholarships and university grants to help high school and college athletes transform leadership on the field into leadership in life. The Davey O'Brien National Quarterback Award winner will be announced Dec. 8 during The Home Depot College Football Awards show, televised by ESPN. The winner is not required to have won a weekly award during the season. A list of 16 semifinalists will be announced on Nov. 10, while the three finalists will be named on Nov. 22. The Davey O'Brien Fan Vote, now in its 10th year, gives fans a chance to play a role in determining the award winner by voting daily at VoteOBrien.org. The Sooners, who lead the nation with their 14 offensive touchdowns of at least 40 yards (next highest total is 10), host Kansas on Saturday at 6 p.m. CT.